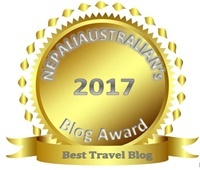 It is an honor to be nominated for the Unique Blogger Award by Nisha from InspiresN. Thank you so much Nisha for your recognition and support of A Mindful Traveller. Nisha too is a busy mum, who shares her recipes, photos and experiences on her wonderful blog InspiresN. Check it out here and give her a follow if you have not already done so! Q1. How do you get the motivation for new posts in your blog? I love sharing my travel stories, so my motivation comes from the wonderful places I have been blessed to have visited across the years. I like to tie in homemade recipes as well, which relate to the travel posts I write. Q2. What is your favorite travel destination ? My favourite travel destination would have to be Europe, especially Italy. There are so many beautiful countries rich in history so close to one another in this area of the world. Q3. What was the most proudest moment of your life ? My proudest moment would be having my two children. Such an accomplishment and an achievement. Do you cook and if so what is your favourite dish to cook? Being terrified is normal! It’s stepping into the unknown really, but it’s the best thing ever!! Congratulations again Lorelle! loved reading your answers. Nice to know about your lovely kids , that is sure a proud moment! Europe is such a beautiful place and have heard so much about it ,hope I could visit some time. 2. I collect recipe books. My third daughter forcibly made me give 9 wine cases full to a charity shop a few years ago. I have collected back quite a few of them and added many others since …. It’s lovely to get to know more about the wonderful people who support my blog. I have a weakness for cookbooks too!! Are you children older?? My children are all grown up – four girls … eldest is 30 and married, second is 27 and has lived in KL for more than four years but I think may come back to Europe at least for a while, next year, number three is nearly 25 and took a late decision to do an Illustration Degree so is in her foundation year now and the baby is 22 and graduated in Fine Arts in the summer. It was number three then aged 16 who got stern with me about my books when we downsized our house. In fairness, at the time, she was probably right!! Congrats! Italy is a lovely country indeed, at least for tourists. I just came back from Sicily. Thank you 🙂 I am indeed! Only possible in Europe 😀 We were chasing the sun, as it’s gotten cold and chilly in Poland since more than a month already.